This silver place card holder brings class to any location, whether used in restaurants & buffets or retail stores, cafes, or weddings. The table placecard display is made of stainless steel for a long lasting display, perfect for consistent use in any of the venues listed above. The chrome finish adds a stylish look that allows the versatile display to be used in formal events as easily as in stores. The silver place card holder, like other wedding & restaurant displays, have a coiled ring that holds cards in place securely. 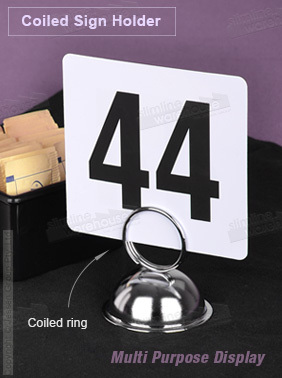 The elegant placecard display has a small footprint that fits easily onto tables and counters. The design of this stand has a wide base to ensure stability during use and keep the display upright. Order today to help guests find their table or customers identify different goods!